Hayes’ Sam Lagando, left, brings the ball into the offensive zone during the first quarter of Tuesday’s Division I, Region 1 tournament opener against visiting Brunswick. 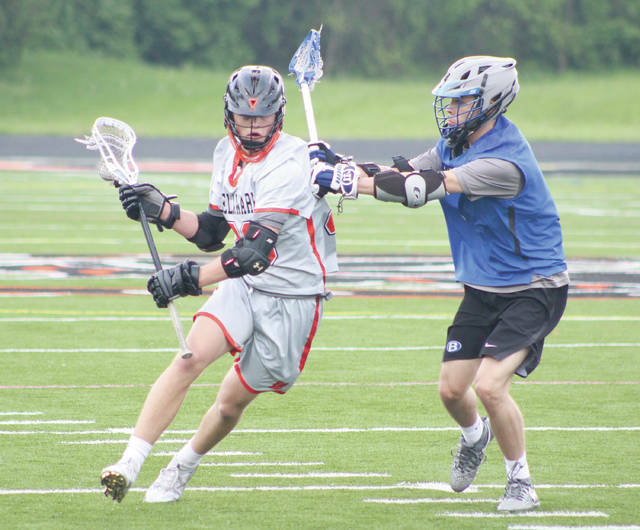 It took nearly six minutes to crack the scoring column, but the goals came in bunches once they finally came as the Delaware Hayes boys lacrosse team rolled to a 15-2 win over Brunswick in the first round of the Division I, Region 1 tournament Tuesday in Delaware. The sixth-seeded Pacers broke the scoring seal when Andrew Lyon found the back of the net off a feed from Alex Schumacher with 6:15 left in the first quarter. It was Schumacher’s turn to score two minutes later and Casey Eiland scored off an assists from Blake Eiland with 25 seconds left in the opening quarter to make it a 3-0 game after one. Hayes goalie Tyler Carney made a solid save to start the second quarter and Lyon scored quickly in transition to balloon the edge to 4-0 less than a minute in. Lyon and the Pacers weren’t done, either … not even close. Lyon’s fourth of the game made it 7-0 midway through the second and Hayes added a couple more to make it an 8-0 game at the break. The Pacers kept scoring, but, thanks to shutdown defense from Carney and company, they didn’t have to. The Hayes defense didn’t allow a goal until 14th-seeded Brunswick finally slipped one into the back of the net with 2:52 left in the third quarter. Lyon finished with a game-high five goals while Schmacher and Casey Eiland had three apiece. Next up, Hayes will play fourth-seeded Dublin Jerome in Friday’s second round in Dublin. The 10th-seeded Mustangs scored the first two goals of the second half, slicing their deficit to four, but the third-seeded Braves scored eight unanswered to roll to an 18-7 win in the first round of the Division I, Region I tournament Tuesday in Lewis Center. Olentangy scored the first four goals of the game to set the tone. Kyle Milliron and Riley Bruening had one each while Khairi Sears poured in two straight during the spurt. Bruening finished with a game-best five goals while Sears had four in the win. The 13th-seeded Irish scored to slice their early two-goal deficit in half, but the second-seeded Patriots scored six straight to take control on the way to a lopsided win in the first round of the Division I, Region 1 tournament Tuesday in Powell. Kyle Dolan and Aidan Kenley had two goals apiece while Johnny Wiseman and Pete Spallino also scored during the game-deciding run. Mason Handa, Jack Applegate and Cooper Durst had hat tricks to lead the eighth-seeded Pioneers to a convincing win over the seventh-seeded Bees in the first round of the Division I, Region 1 tournament Tuesday in Medina. Jillian Jakse had four hits and five RBI and Katelyn Perkins allowed just one hit over six solid innings to lead Jonathan Alder to a 12-2, six-inning win over Buckeye Valley in a Division II district semifinal Tuesday in Lewis Center. Lisa Leienberger had the Barons’ lone hit: a two-run homer which gave her team a 2-0 lead in the top of the first inning. Steady rain came after that and, after a two-hour delay, the Pioneers found their form. Jakse connected on a two-run, game-tying homer in the bottom of the first and her two-run double made it 4-2 an inning later. Alder’s Cierra Clark hammered a grand slam in the fourth to put the game out of reach. Jack Spohn had eight solo blocks and five kills to lead Olentangy to a 25-17, 25-13 win over Hilliard Darby in Tuesday night’s OCC Challenge. Jamir Benton and Aaric Gossett added six kills apiece while Bentley Azbell finished with a team-best 12 digs.